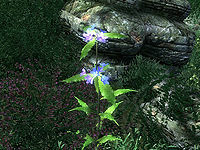 A tall, flowering plant that is most common in the West Weald region of Cyrodiil. 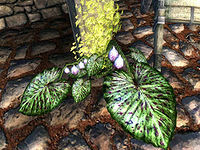 Alocasia is the short, fruit-bearing plant native to the Mania side of the Shivering isles. 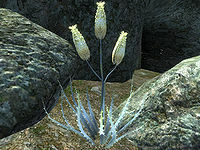 Aloe Vera is a tall, leafy plant that can be commonly seen in the Golden Coast region of Cyrodiil. Arrowroot is a medium-sized, thick, rubbery tuber with tall leaves and small white flowers. 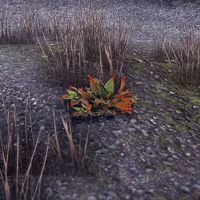 Originally from the province of Valenwood, it is commonly found growing in the Gold Coast and Nibenay Valley regions of Cyrodiil. 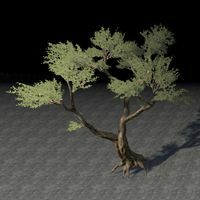 A large tree that grows all around Tamriel. Fallen logs can be harvested to craft Ash items. Housing furnishers also sell domestic Ash trees to be planted on homeowners' properties. A small, low growing plant whose strong-smelling leaves are colored green from the base which fades to red at their extremities. The leaves are known for their insect-repelling qualities and Ash Basil can found growing the Stonefalls region. The local Dreugh also see the plant as a food source, those that feed upon it are said to secrete a superior, more durable Dreugh Wax. Ash yams are a grey, bulbous root vegetable with a few small leaves. 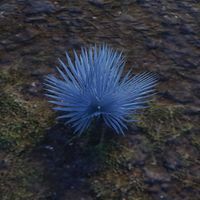 Commonly found in the Ascadian Isles region of Vvardenfell. 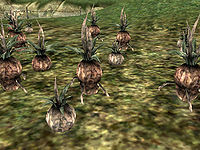 Following the Red Year of 4E 5, ash yams may are also farmed in and around the Dunmer settlements on Solstheim. 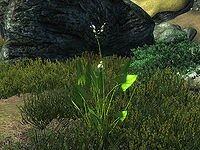 Ashen Fern is a rare native plant from the region of Vvardenfell, in the province of Morrowind. It is commonly found along the coast, including the Bitter Coast. It is used by the Ahemmusa Tribe, to mask their scent while hunting, and as a tribute to the cairn of Nalor Ahemmusa, their first Ashkhan. 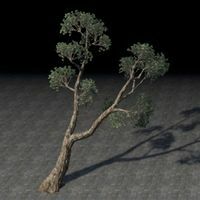 Ashland trees are native to Vvardenfell, but can be purchased from housing furnishers to be planted in homes across Tamriel. 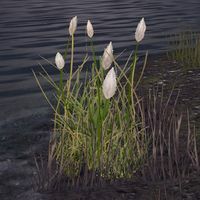 Ashreeds grow in the swamps north of Ebonheart. 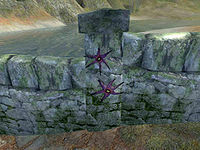 Aster Bloom is a purple, starfish-shaped fungus found in the Mania side of the Shivering Isles. This page was last modified on 21 March 2019, at 14:47.